Miami Trace senior Cameron Carter drives to the basket past Unioto senior Gabe Fisher during a Division II Sectional championship game Saturday, Feb. 24, 2018 at Southeastern High School. carter was the game’s leading scorer with 27 points. Miami Trace senior Dakota Bolton puts up a shot during a Division II Sectional championship game against Unioto Saturday, Feb. 24, 2018 at Southeastern High School. Darby Tyree, left, Miami Trace senior, shoots over Unioto senior Peyton Hill during a Sectional championship game at Southeastern High School Saturday, Feb. 24, 2018. CHILLICOTHE — Miami Trace saved their best for last during a Division II Sectional championship game against the Unioto Sherman Tanks Saturday afternoon at Southeastern High School. After leading at the start, 4-0, the Panthers fell behind by as many as 23 points and seemed headed for a rout at the hands of the No. 12-ranked Tanks. Miami Trace had a massive fourth quarter, scoring 35 points, clawing back to within three points (68-65) with 23 seconds to play. 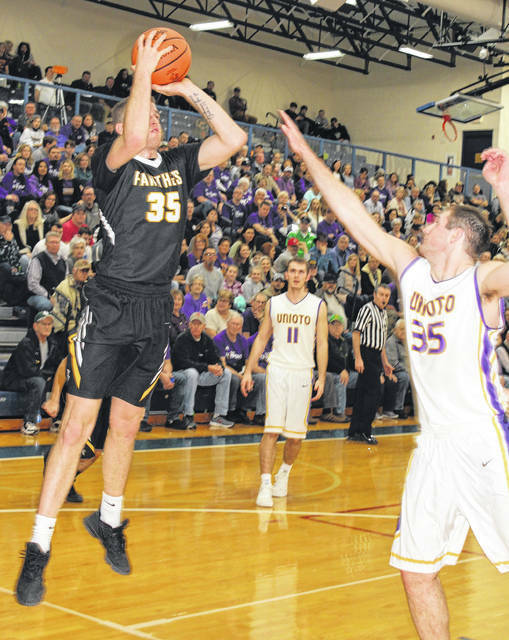 The difference came at the free throw line as Unioto had a whopping 43 foul shot attempts, sinking 27 as they advanced to the District tournament, 73-66. Senior Cameron Carter led the game for Miami Trace with 27 points. Carter was also the game-leader with seven assists. Senior Darby Tyree ended his Panther career with 13 points and 12 rebounds (tops in the game) for a final double-double. Junior Austin Brown and senior Dakota Bolton both scored 10 points. Brown had seven rebounds, three assists and three steals. For Unioto, senior Logan Swackhammer led with 20 points. Swackhammer was 13 of 16 from the free throw line. Senior Gabe Fisher scored 17 points and turned in a double-double of his own with 10 rebounds. Senior Brandon Kennedy scored 14 points and senior Peyton Hill added 13 points. Unioto led at the end of the first quarter, 18-9. At the half, the Shermans seemed in control, 32-20. Unioto spread the lead out a little more in the third quarter, going in front 49-31. The two teams combined to score 59 points in the fourth quarter alone. Miami Trace ends the 2017-18 season with a record of 12-12. The Tanks (now 20-2) will face Warren in the District semifinals at the Convocation Center in Athens Friday at 8 p.m. In the other District semifinal Friday, Sheridan will take on Waverly. 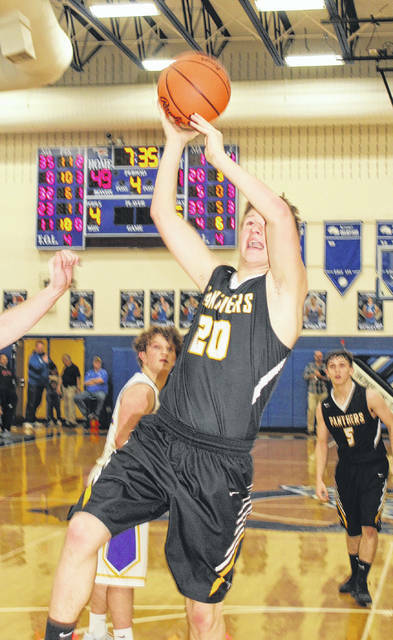 “They’re a good ball club and obviously, Coach (Matt) Hoops does a good job of having the right personnel on the floor to make free throws,” Miami Trace head coach Rob Pittser said. “We got in a position there late in the game where we didn’t have much choice,” Pittser said. “We had to put them on the line as much as we could. “The game started out a little disconcerting for us,” Pittser said. “We’ve been scoring the ball really well to start games. Today was the opposite of that. “We were playing a good team,” Pittser said. “We were having trouble scoring the ball, we were down double figures at halftime. When they got up by 20-25 points, whatever it was, in the third quarter, it could have really went sideways. “Gosh, how proud we are of the kids,” Pittser said. “The way they continued to battle and come back. That only happens when you have seniors that care. These kids have been invested all year. They’ve worked hard all year. We had two good days of practice. Sometimes, you get into February and it gets tough. Miami Trace says thank you and farewell to eight seniors: Cameron Carter, Darby Tyree, Matt Fender, Dillon Coe, Adam Ginn, Brett Lewis, Heath Cockerill and Dakota Bolton. “They have really provided some help and stability for our program,” Pittser said. “We feel like they’ve put our underclassmen in a position to follow some success. We’re going to miss this group, with Darby being a four-year player and Cam with all he’s brought to the table. “We can literally go down the schedule and pick a different night — Heath Cockerill on this night, big threes; Dakota Bolton on this night, a couple of steals and a bucket; Brett Lewis great defensive energy and a breakaway lay-up in crunch time; Matt Fender, two threes tonight from the top of the key when we were struggling. They’ve all had moments. 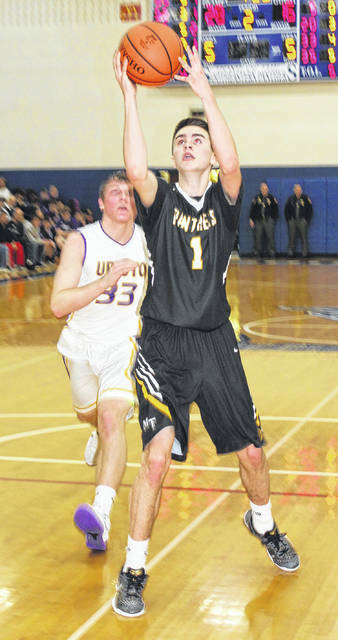 “Really, through three quarters, we were solid on the defensive end,” Unioto head coach Matt Hoops said. “As they became desperate trying to play from behind, they became dangerous. I felt like we just got sloppy on the offensive end, which started to put pressure on our defense. They had a lot of momentum, but I thought our guys battled back down the stretch and made enough plays to win it. Saturday night at Southeastern, the No. 1 seed, Fairland, dispatched the Hillsboro Indians, 71-39 to advance to the Convo to play Vinton County Thursday at 6:15 p.m.
Rounding out the District, Fairfield Union will play Gallia Academy Thursday at 8 p.m. The District championship games will be played Friday, March 9 at 6:15 and 8:15 p.m.
MIAMI TRACE — Cameron Carter 3 (3)-12-27; Darby Tyree 2 (2)-3-13; Austin Brown 5-0-10; Dakota Bolton 2 (2)-0-10; Matt Fender 0 (2)-0-6; Brett Lewis 0-0-0; Austin Mathews 0-0-0; Heath Cockerill 0-0-0. TOTALS — 12 (9)-15-66. Free throw shooting: 15 of 20 for 75 percent. Three-point field goals: Carter, 3; Tyree, 2; Bolton, 2; Fender, 2. Combined field goal shooting: 21 of 56 for 37 percent. Three-point field shooting: 9 of 28 for 32 percent. Rebounds: 28 (10 offensive). Assists: 11. Steals: 11. Blocks: 2. Turnovers: 14. Personal fouls: 26. Bench points: 16. Second chance points: 21. Points off turnovers: 13. UNIOTO — Logan Swackhammer 2 (1)-13-20; Gabe Fisher 3 (1)-8-17; Brandon Kennedy 2 (2)-4-14; Peyton Hill 6-1-13; Chance Smith 0 (2)-0-6; Cade McKee 1-0-2; Gabe McBee 0-1-1; Nick Adkins 0-0-0. TOTALS — 14 (6)-27-73. Free throw shooting: 27 of 43 for 62 percent. Three-point field goals: Kennedy, 2; Smith, 2; Swackhammer, Fisher. Combined field goal shooting: 20 of 39 for 51 percent. Three-point field goal shooting: 6 of 16 for 37 percent. Rebounds: 30 (4 offensive). Assists: 5. Steals: 8. Blocks: 3. Turnovers: 15. Personal fouls: 15. Bench points: 3. Second chance points: 5. Points off turnovers: 17. Thank you to assistant coach Cory Patton for providing the stat sheets again all season long and to scorebook keeper Tom ‘Chatter’ Harris.